IP SURVEILLANCE IP-based surveillance systems and video analytics can successfully reside on an existing enterprise network with limited liabilities. Here’s how. 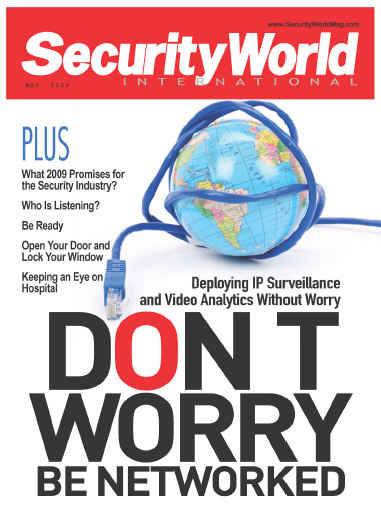 What 2009 Promises for the Security Industry? MARKET OUTLOOK 29-year security veteran Martin Tee, Regional Manager of AES-IntelliNet, talks about changes in security landscape and some technology trends to watch this year. EAVESDROPPING DETECTION An eavesdropping detection specialist with over 30-year experience guides us in how to detect bugs and wiretaps in our offices. SIMULATING DISASTER A prime worldwide challenge is to be prepared for an unfortunate event of a disruption and the right choice of authentic simulator can be the key to successful incident response. IP SYSTEM Number of security incidents on multi-building facilities is increasing. Therefore, the need for a unified emergency messaging system is required. Chris Adams, President & CEO of Pixim, talks about the company and himself. Fiber optics has had a role in video transmission for many years, but that role is changing with the transition to digital. Tim Phipps, Director of Identity Access Management at HID Global (APAC), talks about HID’s newly released set of solutions that truly converge physical and logical access control. Panasonic IP CCTV improves safety at <?xml:namespace prefix = st1 ns = "urn:schemas-microsoft-com:office:smarttags" />Alder Hey Hospital, U.K. Since its founding in 2001, iOmniscient has won global recognition as having developed the most sophisticated and intelligent software available in the market place.